Casa Samba ist die perfekte tropische Fluchtvilla. Diese Villa mit 5 Schlafzimmern und 6 Bädern wurde in einen Bluff gebaut und überblickt den Regenwald mit weitem Blick auf den Pazifischen Ozean in der Nähe des weißen Sandstrands von Playa Espadilla. Es befindet sich in der exklusiven Gegend mit Kopfsteinpflaster am Pacific Canyon Drive, privat, aber leicht zu den örtlichen Märkten, Restaurants, Spas und dem Manual Antonio National Park. Die mehrstöckigen Wohnräume der Villa sind alle offen für Meeresbrise und tropische Gärten mit exotischen Klängen und Düften aus der örtlichen Flora und Fauna. Dies ist nicht die typische Ferienvilla, die hastig gebaut wurde, um einen schnellen Schlag zu bekommen. Der Besitzer lebte tatsächlich mit seiner Familie in Casa Samba und scheute keine Details, um dieses Haus zu einem originellen und exquisit gestalteten balinesischen Stil zu machen. Mit offenen Deckenbalken aus Bambus, handgeschnitzten Steinen und glasierten Steingutspülen, kundenspezifischem Mauerwerk und Fliesen, exotischen Harthölzern und Originalkunstwerken aus aller Welt. Der Pacific Canyon Drive ist eine private Wohngegend, die an der Hauptstraße von Manuel Antonio liegt. Es ist eine von Expats gebaute Gemeinschaft, die den Komfort modernen Luxuslebens in einer tropischen Strandstadt wollte. Alle Annehmlichkeiten und Einrichtungen sind mit Bus, Taxi oder zu Fuß erreichbar. Luxory home in a gorgeous setting. 5 bedroom, 6 bath home with daily maid service. Not just bedrooms, suites. King beds in 3, 1 queen in 1, 2 queens in one. Really comfortable luxury home. Lots of steps so not for everyone. Hello, Dianne, we are so happy you and your group fully enjoyed staying at the Casa Samba for your holidays. We hope you all come back soon to stay again, we highly appreciate guests such as yourselves. Thank you and Pura Vida from all of us at Escape villas Costa Rica. This was more than I could have ever expected. Will come back again, and recommend it to anyone looking for a place in Costa Rica. So glad you have a great time and looking forward to hosting you again soon! Escape Villas always aims to please. Possibly the most beautiful house we've stayed in. Each room was spacious with great attention to detail both aethstetically and functionally. Upstairs deck with TV and pool table was an amazing space with gorgeous views. And yes, they call it the "Monkey Room" for good reason. We got our fill of Capuchins making themselves at home there and even saw some of the more rare Squirrel monkeys. Pool on main level was small, but useful, and had a great view of the Pacific, facing toward the park. Kitchen had everything for cooking and meals in, which is mostly what we did. We were my family of four (two teenage girls) plus my mother, my sister, and her two young children (a toddler and an infant). Communication was great, as was check in and check out. My family lives in Costa Rica and knew are way around, including exactly what activities we wanted to do, so didn't require any help, but the crew there was ready to help arrange anything we wanted and I couldn't help but notice in the Guestbook how many people absolutely loved the available on site chef for quality, variety and flexibility. -depending on your definition of "walking distance", this house possibly isn't. It's more than a few hot, sweaty minutes up the hill to the main road through Manuel Antonio in the area of Café Milagro. My daughters and I, sure. My mother, sister and her kids...not so much. -Stairs!! Did not catch this in one of the other reviews, but there are STAIRS. Over 50 just to get from the street to the house. Hauling our cooler of food was challenging, as well as some of the larger luggage. And inside the house, every room is on a different level accessed by a steep spiral staircase, one bed room three flights up. Combined with a lack of railings around the pool area and deck (for fantastic views, mind you), it made for a real long weekend trying to manage an active 3 year old. All that being said, it was definitely a 5 star experience at a very fair price and we would love to stay here again. Just without very small children and a big cooler. Hello, John thank you for the amazing reviews we always appreciate feedback like this. We are more than happy you and your group enjoyed staying at the casa Samba. Anytime you feel like coming back give us a call we are here to help! All the best and Pura Vida from everyone here at Escape Villas Costa Rica! the home was beautiful and i would love to rate it higher, however, I would not recommend having young children ... to have the windows open in the kitchen/dining area leaves a drop off to the pool and outside from the pool, there is a drop off as well (no railings, just the ledge of the pool). I have a 3yo and we were on edge the whole time worrying about him. the other thing is the immense amount of stairs. this is probably pretty common in the area, but again not great for young children as the stairs to all the upper floors were very narrow and steep. there were many great things about the home if you don't have young kids and don't mind the stairs. the monkeys (capuchin)came: 2 times every day, early morning and early evening. we also saw squirrel monkeys midday and the howler monkeys were nearby, not close enough to see unless you have binoculars. Thanks for your honest review of Casa Samba. You are correct in that the house is perched up high for the view and there are quite a few steps to the entrance. We are glad you did enjoy many things about the villa and we are sorry you were on edge regarding the layout for your 3 year-old. We will endeavor to question future guests as to the ages of their children so they are aware of the way the house is laid out. Again, we appreciate your visit and using Escape Villas and enjoyed having your group stay in Manuel Antonio. The monkey visits are always a treat at this house! We just returned from an amazing stay at Casa Samba. This is a beautiful and well decorated home. Note: this is a very vertical property and there are several spiral staircases. This property might not be ideal for those with mobility issues or very young children. But, we loved it for our school-age children (who enjoyed their own 2 bedroom "apartment" accessed from the deck of the main house) and it would be great with teenagers. We worried about the size of the pool (which is deep but not full size), but it worked even with 8 people in it. The deck area has both sun and shade; we spent a lot of time there and the view is AMAZING. The service here is SPECTACULAR. All of the excursions we selected were terrific-- pick-ups were on time; staff were professional and informed; they were great with kids; everyone spoke English very well. Ask for Manuel as your guide for the national park tours! Our favorite perk was Chef Junior. He is so friendly and accommodating and gentle, in addition to being a great chef. The food was very fresh; we tried different juices every day; Junior appeased our picky eaters. It was such a pleasure to have his meals after a long and hot day of excursions. Finally, this house is very well located--a short drive to the national park and main beach, as well as to Playa Biesanz (which is smaller and nice for families); also a short walk to grocery store, ATM, and souvenir shops, as well as to El Avion restaurant, which kids will enjoy. Escape Villas appreciates your fantastic review of Casa Samba and we are so glad you had a great stay in Manuel Antonio. The villa location is perfect for families, not too far from everything the area has to offer and set in the rain forest with a great ocean view. Our staff thanks you for the kind words about the service you were provided and Chef Junior in particular. He is a shining star when it comes to chefs and we are glad you enjoyed his meals and his great personality. Please come back for another visit, we would love to see you again! Great family vacation around fathers 85th birthday. Ten of us were easily accommodated in this spacious beautifully designed home. We arranged for a cook to prepare breakfast and dinner. Hiro the chef received high marks from all of us including my Cordon Blue Paris trained sister and her husband who for over ten years owned a haute cuisine French restaurant on the Monterey Peninsula. Ricky the property manager was always there to provide tour, restaurant and general recommendations. The house was cleaned top to bottom everyday and kept in immaculate condition. 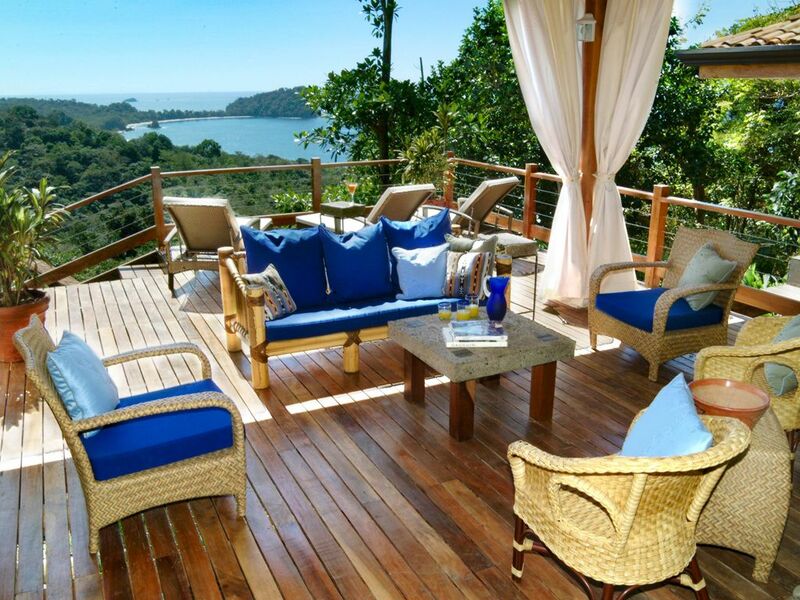 I would highly recommend Casa Samba to anyone traveling to Manuel Antonio. Weltklasse-Sportfischen, unberührte Strände, Wildwasser-Rafting, Canopy-Touren, Mangroven-Touren, Nationalparks, Allrad-Abenteuer, Tierbeobachtungen (sehen Sie Affen, Faultiere und Tukane aus Ihrem Wohnzimmer!) Reiten, Wasserfalltouren, Restaurants und feine Restaurants, Kino, Tanzen, komplettes Tourmenü mit CD-Präsentation beim Einchecken. Ask us about our lower 4 bedroom rates for smaller groups. Always private to just your group. Christmas and New Years weeks are 5 bedrooms only.